As to the Size of this Bird, it is between the common Duck and Teal. 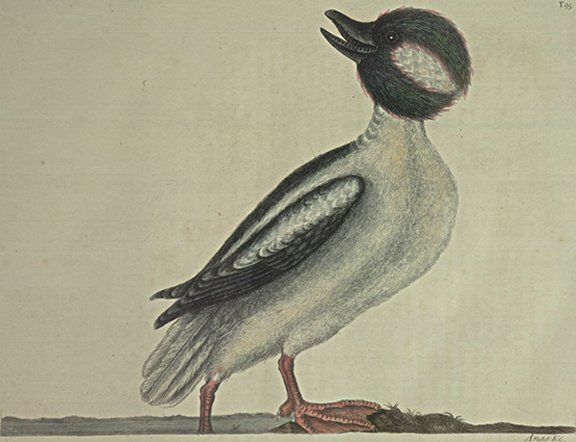 The Bill lead-colour; on each side the Head is a broad space of white; except which, the whole Head is adorned with long loose Feathers elegantly blended with blue, green and purple: the length and loosness of these; Feathers make the Head appear bigger than it is, which seems to have given it the Name of Bussel's Head, that Animal's Head appearing very big by it's being covered with very thick long Hair. The Wings and upper part of the Body have alternate lifts of white and black, extending from the Shoulders of the Wings and Back down to the Rump, viz. The Quill-feathers are black; next to them extends a line of white, next to which is a line of black, then a line of white, and then black, which covers the middle of the Back. The Tail is gray; the Legs are red. The Female is all over of a brown colour; the Head smooth, and without a Ruff; the Legs and Feet brown. They frequent fresh Waters, and appear in Carolina only in Winter.